Little Master Video Slot Review - Casino Answers! 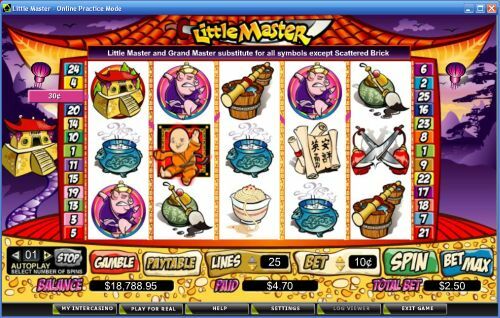 Little Master is a 5-reel, 25-line video slot developed by Cryptologic, featuring two wild symbols, scatter wins, multipliers, a free spins feature, a gamble feature and two bonus games. You can play the Little Master video slot at [Americans: Unfortunately due to legal restrictions you are unable to play at any of the online casinos this game is at. We recommend you trying playing the unique slots at Win A Day Casino instead.]. Bets on the Little Master slot machine are $0.01, $0.02, $0.03, $0.04, $0.05, $0.10, $0.15, $0.20, $0.25, $0.50, $0.75 and every increment of $1 up to $20. 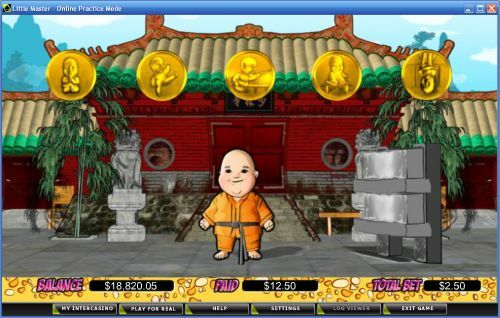 You can select from 1-25 paylines on the Little Master slot game. The minimum bet that you can make is a penny and the maximum bet is $500 per spin. Little Master has a large betting range that is suited towards casual players, high rollers or any online slots player. To play Little Master, select your bet and press the “Spin” button. You can also use “Bet Max” to play all 25 lines on a spin. The highest paying symbol on the Little Master slot game is the Evil Pig symbol. If you hit 5 Evil Pig symbols on a selected payline, you will win Little Master’s 5000 coin top jackpot. Other high paying symbols on Little Master include the Dojo (3000 coins), River (1000 coins) and Buckets of Water (500 coins) symbols. Little Master has two wild symbols – the Little Master and Grand Master symbols. Little Master only appears on reel 2. Grand Master only appears on reel 4. Both will substitute for all symbols except for the Scattered Brick symbol. When Little Master appears on reel 2 and Grand Master on reel 4, you will trigger the Grand Master Challenge bonus game. In the bonus game, you must choose one of three challenges for the Little Master to perform in order to be awarded up to 20 free spins at a 2X multiplier. Following the Grand Master Challenge, the free spins feature will begin. If the feature is re-triggered, you will be awarded the same number of free spins. Free spins are played at the lines and bet of the triggering spin. Free spins feature wins are added to payline and scatter wins. Use the Grand Master Challenge free spins feature on Little Master to win big cash at [Americans: Unfortunately due to legal restrictions you are unable to play at any of the online casinos this game is at. We recommend you trying playing the unique slots at Win A Day Casino instead.]! Press the “Gamble” button after any win you get on the Little Master slot game to activate its gamble feature. You can guess the colour of the facedown card to potentially double your win if correct or you can guess the suit to quadruple your win. To collect your winnings and exit the gamble feature, press the “Take Win” button. Payouts are displayed on the Paytable. Payline wins are multiplied by the bet per loine. Highest win amount is paid on each selected payline. Scatter wins are multiplied by the total bet and added to payline wins. Feature wins are added to scatter and payline wins. Winning combinations pay from left to right, including the Scattered Brick symbol. The Little Master online slot has a simple autoplay mode. You can select up to 99 autoplay spins by using the “+” and “-” buttons. To start the autoplay mode on Little Master, press the “Spin” or “Bet Max” button as you would for any other spin. To stop the autoplay mode, press the “Stop” button next to the autoplay spin counter. The Little Master video slot is packed with so many special features that we can’t help but recommend it. The only negative is that it is not the newest video slot, so its quality of the presentation isn’t the most fantastic. It isn’t horrible by any means, but in the world of online slots, the latest slots are always so much better in presentation than last year’s slots. You can play the Little Master video slot when you sign up and make a deposit at [Americans: Unfortunately due to legal restrictions you are unable to play at any of the online casinos this game is at. We recommend you trying playing the unique slots at Win A Day Casino instead.]! Can players from the United States play Little Master Slots? No, players from the USA cannot play the Little Master online slot game at this time. However, you can play all of the excellent Real-Series Video Slots at Bovada. Can I play an Instant Play version of the Little Master slot at a flash casino? Yes, you can play a flash version of the Little Master video slot for real money at [Americans: Unfortunately due to legal restrictions you are unable to play at any of the online casinos this game is at. We recommend you trying playing the unique slots at Win A Day Casino instead.]. If you have any problems with the flash casino, make sure you have the newest version of Adobe Flash Player. Can I play the Little Master video slot for free? Yes, you can play the Little Master slot game for free if you download the casino software at [Americans: Unfortunately due to legal restrictions you are unable to play at any of the online casinos this game is at. We recommend you trying playing the unique slots at Win A Day Casino instead.]. Practice mode (free play) is not available in the Instant Play Flash casino. How do I get to the bonus game on the Little Master slot game? If you are referring to the Challenge bonus game, you must get three or more Brick scatter symbols from left to right on the reels. This means the Brick symbol needs to be on reels 1, 2 and 3 at the very least. If you want the Grand Master Challenge free spins feature, you need a wild symbol on both reels 2 and 4 at the same time. What is the wild symbol on the Little Master video slot? There are two wild symbols on the Little Master video slot. The Little Master is the first one and it only appears on the second reel. The second wild symbol is the Grand Master, which only appears on reel 4. When both of these wild symbols appear on the reels at the same time, you will trigger the free spins feature bonus game! What is the top jackpot on the Little Master video slot? You will win the top jackpot on the Little Master slot game if you can land 5 Evil Pig symbols on a selected payline. How can I double my winnings on the Little Master slot machine? To double your winnings on the Little Master video slot, after any win, press the “Gamble” button. Then, you can risk your winnings by guessing the card colour of either red or black. If correct, you will win double your win! If incorrect, you will lose your win. How can I quadruple my win on the Little Master online slot game? If you are really greedy and want to multiply your winnings by 4X, you can enter the gamble feature and predict the card suit. Choose Clubs, Spades, Diamonds or Hearts correctly and your winnings will be quadrupled! How come I wasn’t paid for my scatter win on the Little Master online slot? All wins on the Little Master video slot must be left to right, including scatter wins. This means that the scatter symbol must appear on reel 1 and 2 for any scatter win to be paid out. You can win up to 200X your total bet using the Scattered Brick symbol on the Little Master video slot.